For other uses, see High voltage (disambiguation). High voltages may lead to electrical breakdown, resulting in an electrical discharge as illustrated by the plasma filaments streaming from a Tesla coil. The International Electrotechnical Commission and its national counterparts (IET, IEEE, VDE, etc.) define high voltage as above 1000 V for alternating current, and at least 1500 V for direct current—and distinguish it from low voltage (50–1000 V AC or 120–1500 V DC) and extra-low voltage (<50 V AC or <120 V DC) circuits. This is in the context of building wiring and the safety of electrical apparatus. In the United States 2011 National Electrical Code (NEC) is the standard regulating most electrical installations. There are no definitions relating to high voltage. The NEC® covers voltages 600 volts and less and that over 600 volts. The National Electrical Manufacturer's Association (NEMA) defines high voltage as over 100kV to 230kV. British Standard BS 7671:2008 defines high voltage as any voltage difference between conductors that is higher than 1000 V AC or 1500 V ripple-free DC, or any voltage difference between a conductor and Earth that is higher than 600 V AC or 900 V ripple-free DC. Electricians may only be licensed for particular voltage classes, in some jurisdictions. For example, an electrical license for a specialized sub-trade such as installation of HVAC systems, fire alarm systems, closed circuit television systems may be authorized to install systems energized up to only 30 volts between conductors, and may not be permitted to work on mains-voltage circuits. The general public may consider household mains circuits (100–250 V AC), which carry the highest voltages they normally encounter, to be high voltage. Voltages over approximately 50 volts can usually cause dangerous amounts of current to flow through a human being who touches two points of a circuit—so safety standards, in general, are more restrictive around such circuits.. The definition of extra high voltage (EHV) again depends on context. In electric power transmission engineering, EHV equipment carries more than 345,000 volts between conductors. In electronics systems, a power supply that provides greater than 275,000 volts is called an EHV Power Supply, and is often used in experiments in physics. The accelerating voltage for a television cathode ray tube may be described as extra-high voltage or extra-high tension (EHT), compared to other voltage supplies within the equipment. This type of supply ranges from >5 kV to about 50 kV. In automotive engineering, high voltage is defined as voltage in range 30–1000 Vac or 60–1500 Vdc. In digital electronics, a high voltage usually refers to that representing a logic 1 in positive logic and a logic 0 in negative logic. It is not used to indicate a hazardous voltage and levels between ICs to TTL/CMOS standards and their modern derivatives are well below hazardous levels. The highest in mainstream use were 15V for original CMOS and 5V for TTL but modern devices use 3.3V, with 1.8V or lower used in many applications. Voltages greater than 50 V applied across dry unbroken human skin can cause heart fibrillation if they produce electric currents in body tissues that happen to pass through the chest area. The voltage at which there is the danger of electrocution depends on the electrical conductivity of dry human skin. Living human tissue can be protected from damage by the insulating characteristics of dry skin up to around 50 volts. If the same skin becomes wet, if there are wounds, or if the voltage is applied to electrodes that penetrate the skin, then even voltage sources below 40 V can be lethal. Accidental contact with high voltage supplying sufficient energy may result in severe injury or death. This can occur as a person's body provides a path for current flow, causing tissue damage and heart failure. Other injuries can include burns from the arc generated by the accidental contact. These burns can be especially dangerous if the victim's airways are affected. Injuries may also be suffered as a result of the physical forces experienced by people who fall from a great height or are thrown a considerable distance. Low-energy exposure to high voltage may be harmless, such as the spark produced in a dry climate when touching a doorknob after walking across a carpeted floor. The voltage can be in the thousand-volt range, but the current (the rate of charge transfer) is low. Safety equipment used by electrical workers includes insulated rubber gloves and mats. These protect the user from electric shock. Safety equipment is tested regularly to ensure it is still protecting the user. Test regulations vary according to country. Testing companies can test at up 300,000 volts and offer services from glove testing to Elevated Working Platform (or EWP) Truck testing. 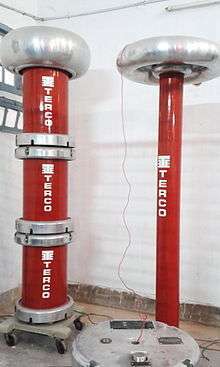 The dielectric breakdown strength of dry air, at Standard Temperature and Pressure (STP), between spherical electrodes is approximately 33 kV/cm. This is only as a rough guide, since the actual breakdown voltage is highly dependent upon the electrode shape and size. Strong electric fields (from high voltages applied to small or pointed conductors) often produce violet-colored corona discharges in air, as well as visible sparks. 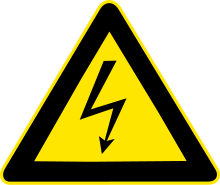 Voltages below about 500–700 volts cannot produce easily visible sparks or glows in air at atmospheric pressure, so by this rule these voltages are "low". However, under conditions of low atmospheric pressure (such as in high-altitude aircraft), or in an environment of noble gas such as argon or neon, sparks appear at much lower voltages. 500 to 700 volts is not a fixed minimum for producing spark breakdown, but it is a rule-of-thumb. For air at STP, the minimum sparkover voltage is around 327 volts, as noted by Friedrich Paschen. Unlike an ohmic conductor, the resistance of an arc decreases as the current increases. This makes unintentional arcs in an electrical apparatus dangerous since even a small arc can grow large enough to damage equipment and start fires if sufficient current is available. Intentionally produced arcs, such as used in lighting or welding, require some element in the circuit to stabilize the arc's current/voltage characteristics. A high voltage is not necessarily dangerous if it cannot deliver substantial current. The common static electric sparks seen under low-humidity conditions always involve voltage well above 700 V. For example, sparks to car doors in winter can involve voltages as high as 20,000 V. Also, physics demonstration devices such as Van de Graaff generators and Wimshurst machines can produce voltages approaching one million volts, yet at worst they deliver a brief sting. That is because the number of electrons involved is not high. These devices have a limited amount of stored energy, so the average current produced is low and usually for a short time, with impulses peaking in the amp range for a nanosecond. During the discharge, these machines apply high voltage to the body for only a millionth of a second or less. So a low-amperage current is applied for a very short time, and the number of electrons involved is very small. The discharge may involve extremely high voltage over very short periods, but, to produce heart fibrillation, an electric power supply must produce a significant current (amperage) in the heart muscle continuing for many milliseconds, and must deposit a total energy in the range of at least millijoules or higher. A current of relatively high amperage at anything more than about fifty volts can therefore be medically significant and potentially fatal. Tesla coils are not electrostatic machines and can produce significant currents for a sustained interval. Although their appearance in operation is similar to high voltage static electricity devices, the current supplied to a human body will be relatively constant as long as contact is maintained, and the voltage will be much higher than the break-down voltage of human skin. Used correctly, the output of a Tesla coil of proper design can have useful therapeutic effects. Used incorrectly, the output can be dangerous or even fatal. Power lines with high voltage warning sign. Electrical transmission and distribution lines for electric power always use voltages significantly higher than 50 volts, so contact with or close approach to the line conductors presents a danger of electrocution. Contact with overhead wires is a frequent cause of injury or death. Metal ladders, farm equipment, boat masts, construction machinery, aerial antennas, and similar objects are frequently involved in fatal contact with overhead wires. Digging into a buried cable can also be dangerous to workers at an excavation site. Digging equipment (either hand tools or machine driven) that contacts a buried cable may energize piping or the ground in the area, resulting in electrocution of nearby workers. A fault in a high-voltage transmission line or substation may result in high currents flowing along the surface of the earth, producing an earth potential rise that also presents a danger of electric shock. Unauthorized persons climbing on power pylons or electrical apparatus are also frequently the victims of electrocution. At very high transmission voltages even a close approach can be hazardous, since the high voltage may arc across a significant air gap. For high-voltage and extra-high-voltage transmission lines, specially trained personnel use "live line" techniques to allow hands-on contact with energized equipment. In this case the worker is electrically connected to the high-voltage line but thoroughly insulated from the earth so that he is at the same electrical potential as that of the line. Since training for such operations is lengthy, and still presents a danger to personnel, only very important transmission lines are subject to maintenance while live. Outside these properly engineered situations, insulation from earth does not guarantee that no current flows to earth—as grounding or arcing to ground can occur in unexpected ways, and high-frequency currents can burn even an ungrounded person. Touching a transmitting antenna is dangerous for this reason, and a high-frequency Tesla coil can sustain a spark with only one endpoint. Protective equipment on high-voltage transmission lines normally prevents formation of an unwanted arc, or ensures that it is quenched within tens of milliseconds. Electrical apparatus that interrupts high-voltage circuits is designed to safely direct the resulting arc so that it dissipates without damage. High voltage circuit breakers often use a blast of high pressure air, a special dielectric gas (such as SF6 under pressure), or immersion in mineral oil to quench the arc when the high voltage circuit is broken. Depending on the prospective short circuit current available at a switchgear line-up, a hazard is presented to maintenance and operating personnel due to the possibility of a high-intensity electric arc. Maximum temperature of an arc can exceed 10,000 kelvin, and the radiant heat, expanding hot air, and explosive vaporization of metal and insulation material can cause severe injury to unprotected workers. Such switchgear line-ups and high-energy arc sources are commonly present in electric power utility substations and generating stations, industrial plants and large commercial buildings. In the United States, the National Fire Protection Association, has published a guideline standard NFPA 70E for evaluating and calculating arc flash hazard, and provides standards for the protective clothing required for electrical workers exposed to such hazards in the workplace. Even voltages insufficient to break down air can be associated with enough energy to ignite atmospheres containing flammable gases or vapours, or suspended dust. For example, hydrogen gas, natural gas, or petrol/gasoline vapor mixed with air can be ignited by sparks produced by electrical apparatus. Examples of industrial facilities with hazardous areas are petrochemical refineries, chemical plants, grain elevators, and coal mines. In recent years, standards for explosion hazard protection have become more uniform between European and North American practice. The "zone" system of classification is now used in modified form in U.S. National Electrical Code and in the Canadian Electrical Code. Intrinsic safety apparatus is now approved for use in North American applications. Electrical discharges, including partial discharge and corona, can produce small quantities of toxic gases, which in a confined space can be a serious health hazard. These gases include ozone and various oxides of nitrogen. The largest-scale sparks are those produced naturally by lightning. An average bolt of negative lightning carries a current of 30 to 50 kiloamperes, transfers a charge of 5 coulombs, and dissipates 500 megajoules of energy (120 kg TNT equivalent, or enough to light a 100-watt light bulb for approximately 2 months). However, an average bolt of positive lightning (from the top of a thunderstorm) may carry a current of 300 to 500 kiloamperes, transfer a charge of up to 300 coulombs, have a potential difference up to 1 gigavolt (a billion volts), and may dissipate 300 GJ of energy (72 tons TNT, or enough energy to light a 100-watt light bulb for up to 95 years). A negative lightning strike typically lasts for only tens of microseconds, but multiple strikes are common. A positive lightning stroke is typically a single event. However, the larger peak current may flow for hundreds of milliseconds, making it considerably hotter and more dangerous than negative lightning. Hazards due to lightning obviously include a direct strike on persons or property. However, lightning can also create dangerous voltage gradients in the earth, as well as an electromagnetic pulse, and can charge extended metal objects such as telephone cables, fences, and pipelines to dangerous voltages that can be carried many miles from the site of the strike. Although many of these objects are not normally conductive, very high voltage can cause the electrical breakdown of such insulators, causing them to act as conductors. These transferred potentials are dangerous to people, livestock, and electronic apparatus. Lightning strikes also start fires and explosions, which result in fatalities, injuries, and property damage. For example, each year in North America, thousands of forest fires are started by lightning strikes. Measures to control lightning can mitigate the hazard; these include lightning rods, shielding wires, and bonding of electrical and structural parts of buildings to form a continuous enclosure. High-voltage lightning discharges in the atmosphere of Jupiter are thought to be the source of the planet's powerful radio frequency emissions. ↑ One such jurisdiction is Manitoba, where the Electrician's Licence Act, CCSM E50 establishes classes of electrician's licences by voltage. ↑ Friedrich Paschen (1889). "Ueber die zum Funkenübergang in Luft, Wasserstoff und Kohlensäure bei verschiedenen Drucken erforderliche Potentialdifferenz". Annalen der Physik. 273 (5): 69–75. Bibcode:1889AnP...273...69P. doi:10.1002/andp.18892730505. ↑ National Institute for Occupational Safety and Health - Fatality Assessment and Control Evaluation: Cases of high-voltage related casualties. Retrieved on November 24, 2008.